I struggle with setting limits on IPad use with my 9-year-old son. Usually, I tell him to stop and he would keep asking for more time. I would think how ungrateful he is, that he should follow the rules, and why can’t he stop when it’s time? Cynthia and I discussed how I could calmly set the limit. I took her advice and added on a twist. He agreed. I could have easily forgotten the reduced time if I didn’t carefully keep track of it. To be efficient, I wrote a note about 10 minutes less time and I posted it on our board for everyone to see. This way, I wasn’t responsible for telling him next time that he had fewer minutes. Instead, he saw his agreement clearly posted on the board. He had accepted the agreement and he felt empowered to honor his decision. He set the timer for 50 minutes and got off on time without asking for more. He seemed to gain power through being independent and responsible rather than through rebellion against the time limit. I felt good about myself because I wasn’t taken advantage of and therefore I didn’t get angry. He knows I’m clear on the rule but I’ll bend a bit as long as he bends as well the next time he plays. I am teaching him the value of give-and-take as well as the importance of following my guidelines. Thank you for your guidance, Cynthia. It’s good working together to find solutions that work for me and my family. 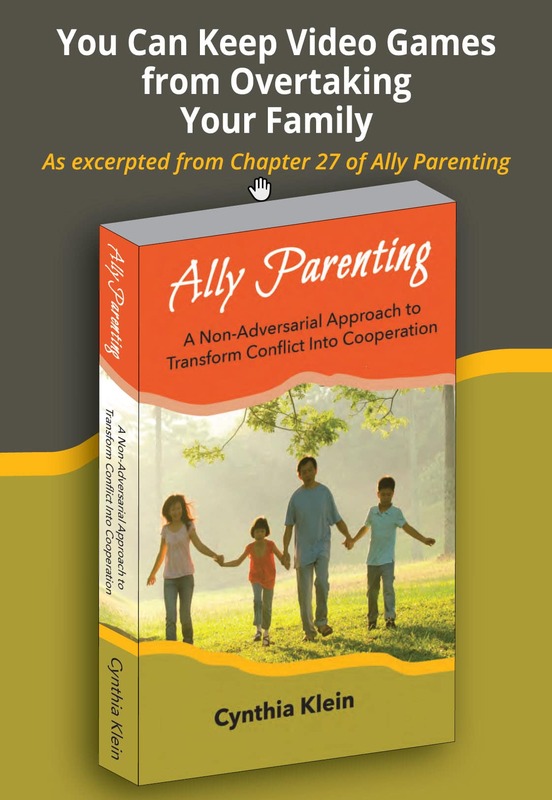 Check out Cynthia’s upcoming book, Ally Parenting – A Non-Adversarial Approach to Transform Conflict Into Cooperation at www.allyparenting.com. Learn how a mom successfully develops a homework plan with her 7-year-old son. ©2017 Cynthia Klein, Bridges 2 Understanding, has been a Family Success Coach since 1994. She works with parents and organizations who want more cooperation, mutual respect and understanding between adults and children. Cynthia presents her expertise through speaking and private parenting coaching sessions. She works with parents of 5 – 25 year-old children. This is a common struggle in many households today. Thanks for posting this!